RP: If only we had helmets! 11 Responses to RP: If only we had helmets! This is so hysterical … I’m suffocating, what a laugh riot. Remove oxygen from any room and hilarity ensues! Amuse your friends while killing them with the new Laughco vacuum pump! If only they had helmets that flung them through the air by their craniums using advanced Gravitronimetric particles, THEN, they’d be feeling some thin air! 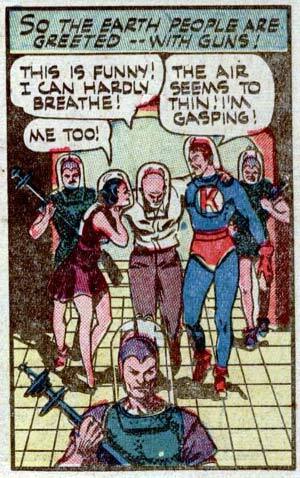 …Is the guy with the “K” on his chest Rocketman? Ironically no, that’s actually Cosmo. With a C. I don’t have any idea why he has a K on his chest unless he is actually Phonetico. The guy that wore his Superman jammies to the great space expedition, is he saying that the air was thicker and is now becoming thinner, or is he trying to say that the air seems TOO thin? what are those fish bowls on their heads ? Kosmos seems to talk funny. If it’s “the air seems to thin” as in “the infinitive form of thin, thinning” that makes some sense but is a strange way of saying that the air was thin. If it’s “the air seems too thin” then someone at copy editing needs to be sacked. -Maybe that was what those tanks of oxygen where for? What year is this comic from? Nevermind … lol! I see it… So I mean if you think about it, this isn’t too bad for the early 50’s.